Saute sliced shallots in 3 tbsps of oil until golden brown (see photo above). Remove the fried shallots and spread them out on a flat plate. Leave the remaining shallots-infused oil in the pan/wok. Heat up the oil and saute the mushrooms until aromatic. Add garlic and saute further until aromatic. Add kale and 2 tbsps of water. Cook until the vegetables become slightly soften. 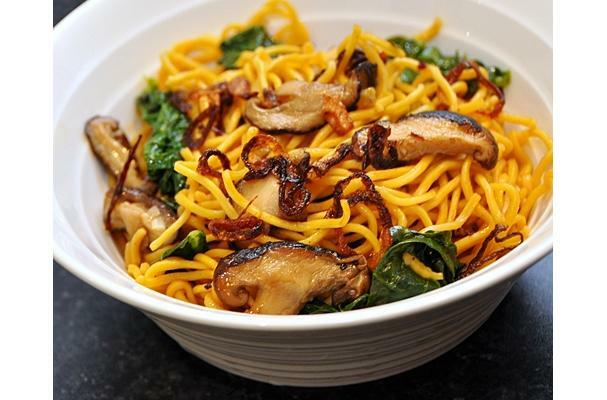 Add noodles, sweet soy sauce and oyster sauce and mix to combine all the ingredients. If the noodles start to stick at the bottom of the pan/wok, add a little water. Cook for 3-5 minutes. Sprinkle fried shallots over the noodles just before serving. You can garnish the noodles with some fresh spring onions and chilles. It also goes well with sambal.